Writing in Emacs – Finding The Right Editor For Me. Why would I write in Emacs? I tried Vi and liked it but it doesn’t suit me as well for the purpose of just writing. I find it difficult that in order to navigate the text I have to leave the input or text mode. After having used Vi multiple times I still haven’t gotten the hang of it. It’s just not friendly enough to me. So at the same time this is also a good oportunity to see what else is there for me (except nano, haha). I guess Emacs is more to my liking. Although it also comes with disadvantages, it is less hard to just start with it. Vi is great but I guess not for me (at this point at least). Emacs gives me a better touch and feel. Besides it’s also slightly more intuitive to the way I use my machine. Though, I am just at the start of this. I still don’t even know how to use search. Learning the vi keybindings is a great benefit though, as you learn how you can navigate with one hand only. And you don’t have to use the ctrl-button so much as in Emacs. Which is a great benefit (think emacs pinky). But that benefit comes with a cost: the need to leave the text input mode in order to navigate. So why wouldn’t I use a GUI-like editor, such as Gedit for example – which is a great application and also has syntax highlighting. That’s simply because I don’t want to leave the command-line. I’d like to hang in there as much as I can, simply because once you get it, it’s more fun and efficient than having so many windows open. As with everything, I will be learning as I go. There is good things about both editors and it’s just about using either of them to see which will stick with me. I also should be following up more on the vimtutorial more than what I’ve done so far to find out which one really is better for me. It’s just crazy; for so long I have been editing WordPress posts in silly html and only now I discover there is also a great Markdown plugin. Markdown gives a really easy method to control the output of your text. It really is very easy. The first time I encountered a type of markdown is when I started editing Wikipedia articles in 2001. The Wikimedia syntax is also fairly easy and a lot easier and cleaner to edit text with then plain html. Markdown is a different syntax that came around some years later and is even easier. I started writing in Markdown when I discovered Jekyll, a static site generator. After that I was missing it badly in a WordPress environment. But now, together with the ability to add and edit posts through the command-line, I can finally do away with the admin interface of WordPress and I can easily ignore my browsers. Yeah! 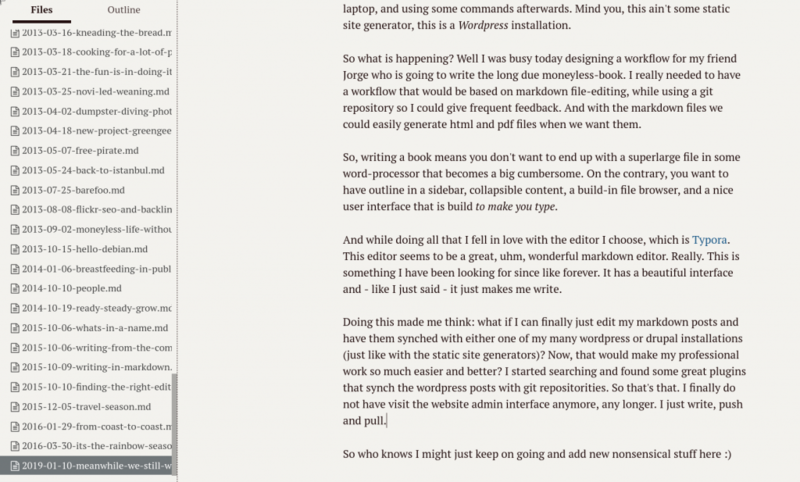 Update: After saving this post, I notice that wp-cli is not saving it as markdown, maybe that’s a bug? Need to investigate. Also the markdown syntax for linking doesn’t work as expected.